Tonbridge is twinned with - Le Puy en Velay in France and Heusenstammn in Germany since 1984. Tonbridge School founded in 1553 by Sir Andrew Judde is a private boys school located in Tonbridge. 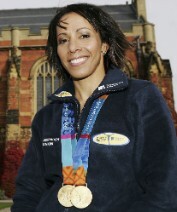 Kelly Holmes - Born in Pembury near Tonbridge. Still lives in the area and often seen out jogging or around town. Henry Cooper - Not born in Tonbridge, but lived in the town for over 10 years until his death in 2011. Colin Blythe Wisden - Cricketer of the Year in 1904 lived at 29 Goldsmid road, Tonbridge. Want to add a TONBRIDGE FACT to this page!! Want to add more details to this site for free?